Sarv provides you a 10-digit dynamic virtual mobile number hosted on a server which can expand your business opportunities. Our virtual mobile number service helps in appropriate management of calls and SMS. Now use a single number to receive all your voice calls, SMS, and WhatsApp messages. As a successful Business communication solution Provider we aim to offer quality services which builds your brand image, make communication effective and gives nationwide reach. And Virtual number proves to be highly productive in engaging user into effective communication. One number that supports all your business requirements (Call, SMS, and WhatsApp). Our virtual Mobile Number comes with expanded range of powerful features which can enhance your brand image and make the business communication more effective. Our virtual number serves as all-in-one package (Call, whatsapp, SMS). It will make your business communication more effective. 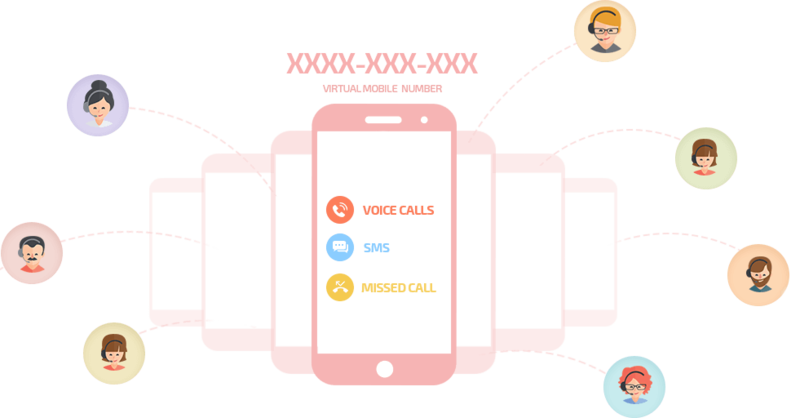 Virtual mobile number receives messages to make the communication more effective and simplified. You can check all your messages directly from your account through this two-way communication. A single 10-digit mobile number can be used for receiving Inbound calls, missed call and for long code. It makes the business communication more efficient, economic and user-friendly. Now quickly complete the setup within 5 minutes. Need not worry about the installation process. Our system will setup and manage your account. Our advanced platform ensures high capacity; you can handle 1000s of calls and messages at once. Our virtual mobile number lets you communicate with more and more customers. Sarv’s data centers ensures the continuity of your services. We have four data centers settled up in 4 different zero seismic zone cities. So if in case one is interrupted due to any technical issue, we will route your service to another datacenter. We come up with packet of inexpensive, still best plans in the industry which are capable to cater all your business needs. Analyze the prices and choose the plan which best suits your business requirement. Before buying our virtual Mobile Number get fully satisfied with our 15 days free trial. Play with all the features and see how virtual mobile number can benefit your business. Everyone desires for more in the same package price with no extra charges. With Sarv you get benefit of two in one single platform. Our virtual mobile number supports all the features of IVR. Setup your Virtual Mobile Number completely free with Sarv. No hidden charges applied.